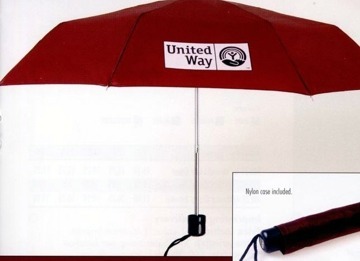 Cheap Personalized Folding Umbrellas Custom Printed in Bulk. Promotional, Bargain Prices for USA, Canada. 36 in. arc. Bulk personalized folding umbrellas, high quality, currently on sale. Budget Prices in the USA and Canada. 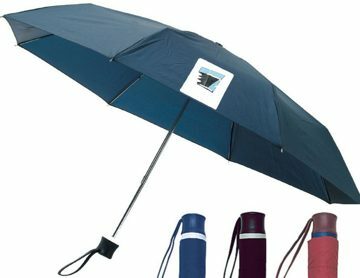 Our personalized folding umbrellas are great for purses, glove boxes or bags. 170T polyester fabrication. 36 arc, 18" rib, 8 1/2" length when closed. Lightweight, aluminum shaft and frame. Plastic handle with wrist strap. Hand operated, folding design with Velcro closure. Nylon protective cover. We also supply blank (not custom imprinted) folding umbrellas at EQP (End Quantity Price). Free artwork design, American clients pay no taxes. Prices below include your custom imprint in one imprint color. Add $0.40 for each extra imprint color or location. Matching color case (sleeve) is included. PRODUCTION TIME: 3-5 working days after art approval; blank (not custom imprinted) umbrellas ship next day. Canadian Clients : please multiply all the US prices by 1.30 to get the CAD$ prices. Imprint Size: 6-1/2" x 3" on one panel. Matching Color Nylon Sleeve (Case) is included. Production Time: 10 days after art approval; blank (not custom imprinted) umbrellas ship next day.